The 2008 Theatre Benefit, a preview performance of The Country Girl, starring Morgan Freeman, Frances McDormand and Peter Gallagher, raised more than $160,000 in support for the Ackerman Institute. The event, held on April 22, also included a pre-theatre dinner, held in the Manhattan Ballroom (designed by Ackerman Board member Arnold Syrop) in the New York Marriott Marquis Hotel. Three hundred friends and supporters of the Ackerman Institute purchased play tickets; 200 attended the dinner. One new feature at this year’s dinner was a silent auction offering a unique item – a reservation for six at Rao’s, the famous East Harlem Italian restaurant. Rao’s is renowned for its food, celebrity clientele and exclusiveness. It is not uncommon to wait one year for a reservation at one of the tiny restaurant’s ten tables. Board member Carole Mallement secured the auction prize, which was won by Board member Alan Quasha. Ms. Netter and Lois Braverman both acknowledged Ms. Mallement’s contribution. In her remarks, Ms. Braverman also cited Ms. Netter for her dedication. “Putting together an evening like this requires enormous commitment and a lot of hard work, “ Ms. Braverman said. 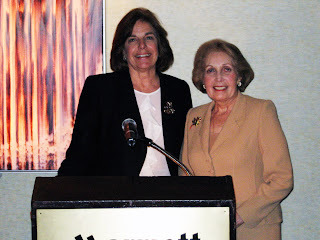 “I want to thank Alice Netter, who once again this year has done an amazing job.” Ms. Braverman went on to thank another Board member, Jeannie Ackerman Curhan, who donated gourmet chocolates for the dinner. Finally, Ms. Braverman reminded the guests of the real meaning of the evening.